2 bedroom and 2 full bathroom corner unit in 'Quantum' - the highly sought after concrete high-rise located in the heart of New West. This beautiful home offers an open concept floorplan and a gourmet kitchen with dark cabinetry, granite countertops, stainless steel appliances, gas stove, built-in microwave and a convenient eating bar. 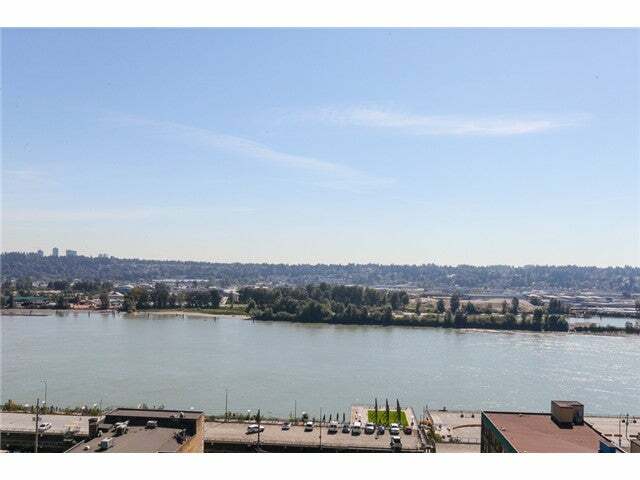 Expansive floor to ceiling windows create a bright and spacious feel and boast unobstructed Fraser River views, making you never want to leave this perfect home. This fantastic building welcomes you with a gorgeous lobby waterfall, allows rentals and 2 pets, and offers fantastic amenities such as a gym, sauna, meeting rooms and a tranquil rooftop garden. Just steps away from all desired amentities.